Our society is facing on the environmental and energy resource problems. Effective utilization of energy resources is the feasible method to solve the these problems. We are performing the fundamental research of electrochemical energy conversion devices such as fuel cells and rechargeable batteries. In particular, we focus on the “interface” at which the electrochemical reactions proceed and try to clarify the fundamental concept to enhance the rate and the reversibility of the interfacial reaction. The targets in our laboratory are 1), 2), and 3) as shown below. Fundamental research and material search of magnesium metal secondary batteries, sodium-ion batteries, and aqueous lithium-ion batteries as next-generation rechargeable batteries beyond lithium-ion batteries. Fundamental research and material search of anion exchange membrane fuel cells and zinc-air secondary batteries. 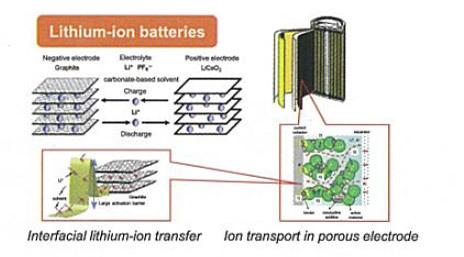 In anion exchange membrane fuel cells, the reduction reaction oxygen supplied from air is used as the positive electrode reaction and the oxidation reaction of polyol is used as the negative electrode reaction. 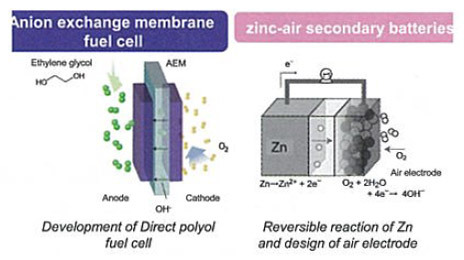 In zinc-air secondary batteries, the reduction and evolution reaction oxygen supplied from air is used as the positive electrode reaction and the dissolution and deposition reaction of zinc metal is used as the negative electrode reaction.